This newsletter is published quarterly using a cycle of perspectives on the Integral City viewed from: Planet, People, Place and Power. The theme of this issue is People. International developer Gail Hochachka proposes that people’s feelings, beliefs and worldviews affect how they are ready and willing to participate in sustainable behaviors (2005, p. 1). Moreover, she points out that traumatic experiences, like natural disasters and war, can damage people and leave them disabled from appropriate responses. Although these interior realities of a city’s population have been largely ignored or discounted because they are subjective, invisible and difficult to study, they are just as real as the exterior physical realities of the city. Interior realities create an interior environment that has just as many or more layers, contours and textures to it as geographic environments. We have studied them through the lenses of psychology, philosophy and the humanities, but until recently we have not recognized that, like our exterior qualities, they evolve and develop. We map the paleontology of our interiors through the shifts in worldviews that enable the growth of our interior landscapes and, therefore, our capacities for response, adaptability and resilience. The key centers of those internal views are the self, the other (family, clan) and the world (society, sectors, spheres of influence, regions, globe). With his encyclicals on the Environment and Climate Change (May, June, 2015), Pope Francis seems to be thinking as big as a Planet of Integral Cities. Pope Francis has gifted the world with a Kosmic view of the environment and the implications for climate change. He instructs the faithful that God has not given dominion to man to dominate the environment but to respect all Life. He explicates what Integral City calls the Master Code – emphasizing that man’s individual expression must be viewed in relationship to others (particularly those in the developing world and the poor) and nature. Pope Francis’ sweeping views that marry spirituality and science bring together the inner and outer worlds of peoples everywhere. He explicitly references our need to embrace Beauty and Goodness with our pursuit of Truth. Without question Pope Francis has opened the door to an explicit Integral Ecology (the name of a whole chapter of the May 2015, Encyclical). In fact, in the May/June 2015 Encyclical the Pope has used the word “integral” 23 times. Now is the time for all good people to come to the support of our sister/Mother Earth to optimize our impact on our Planet of Cities. How does Integral City work with a whole city? Durant Oklahoma is emerging as a gem of a generative action research process. We started with a visit in 2013 at the invitation of 2 City Leaders (Greg Massey, President of First United Bank, and Gary Batton, Chief of the Choctaw Nation). At that time we did due diligence with Integral City’s 12 Intelligences and came back to a small group (that became Durant’s Core Team for the next year) with a long term Proposal for Discovering, Imagining, Designing, and Delivering a unified vision for Durant and the strategies to implement it. From that Core Team, Imagine Durant was born as a project, financed by the 4 Voices of the city and guided by Executive Director, Kara Hendrickson. On April 17-19, 2015, Imagine Durant began its visioning process, along with the Integral City team of: Beth Sanders, City Planner and Civic Meshworker; Linda Shore, City Management Advisor; Scott Moore, Architect and Community Planner; David Jaber, Natural Step Sustainability Expert; under the AQtivating leadership of Marilyn Hamilton. We convened the first (of nine) dialogues where community thought leaders met to exchange and brainstorm possibilities for the future of Durant, Oklahoma. The special focus of this first round of dialogues was on the Economy and Community of Durant. Twenty-four Thought Leaders pulled inspiration from their surroundings at the historical Three Valley Museum, located in downtown Durant. Leaders and community members from a wide variety of organizations, businesses and industries took time from their family and friends to share their stories, hopes, concerns, and visions for the city of Durant, Oklahoma. The dialogue began with reflections among participants over an evening meal where they each shared stories of their personal connection with the community. Over the next 3 days participants asked good questions, explored four revealing scenarios (Dark Days Ahead, Status Quo, Durant Leads the Way, The Stars Aligned in Durant) and finished with commitments to take the next steps together. 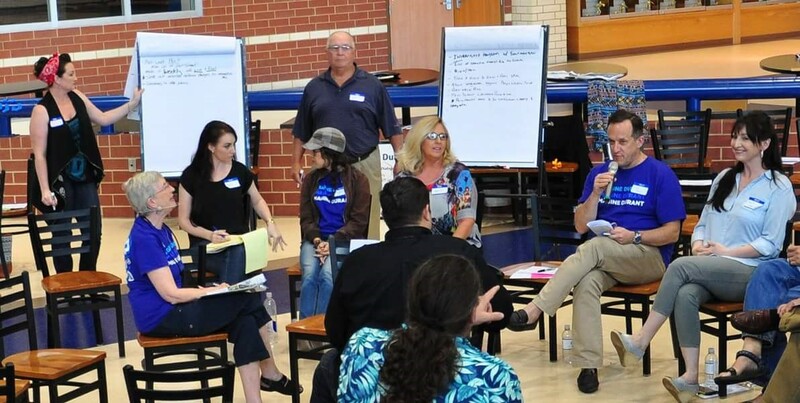 On June 13, 2015, a Public Dialogue continued the Visioning process, as citizens gathered to explore Burning Questions about Leadership Capacity, Engaging Community, Civic Management & Performance and Influencing Business Development. Participants offered generous resources including designing apps for “Discover Durant” and engaging veterans’ skills and interests with city projects. In September 2015, this first round will conclude with a dialogue with Durant’s Policy Makers, presenting the Harvests from the Thought Leaders and Public and seeking input for taking ideas forward for early wins, supporting resources and aligning long-term strategies. Read the full Thought Leaders story in the harvest report in the Resources Link below. Have you observed the “Pop-up” phenomenon that is emerging as a form of urban engagement, experiment and enterprise? Pop-ups are usually temporary co-creations of citizens, artists, performers, entrepreneurs and even serious city developers. It is often associated with “tactical urbanism” and can emerge as restaurants, retail, and/or entertainment in places like urban streets, flood plains, under bridges. Joining MetaIntegral’s Integral Theory Conference for its fourth international event (and sponsoring the conference for the third time) Integral City has designed Pop-Up Playgrounds where we invite conference participants to harvest conference insights with the help of the Knowing Field. Lead Constellator, Diana Claire Douglas (Founder, of Knowing Field Designs) will help us to explore and experiment with our conference experience – drawing on the systemic constellation process that taps into our collective intelligence and releases energy for surprising reflections and fun results. In the context of our Integral City engagements, we call this method AQAL Systemic Constellation Work. Guided by Integral City’s Master Code, we will co-create conditions for participants to engage conference outcomes that take care of Self, Others, ITC2015 and the Places of our hearts and homes. Click here for 10 reasons to Join our Pop-Up Playground. June 21 marks the start of what Integral City calls the People Quarter (from June 21 toSeptember 20). What people perspectives have been inspired by the Pope’s Integral Ecology message or Durant’s Integral City practices? What inspirations, actions, methods revitalize you? We notice that People are gaining deeper, wider, broader insights of our Planet of Cities connecting not only because of disasters and sustainability challenges but because they are motivated to wake up, grow up and clean up. Visit us at Integral City Collective on Facebook and post a short update or a photo. 2. Tam Lundy’s leadership tip (offered in Integral Leadership Review – Canada Issue offered a Leadership Tip on Generative Change) explains how leaders generate change through both integral thinking and practice. Connect to Tam’s key pointing out instructions for generativity that align well with Integral City’s 12 Intelligences here and download her Generative Change: A Practical Primer. 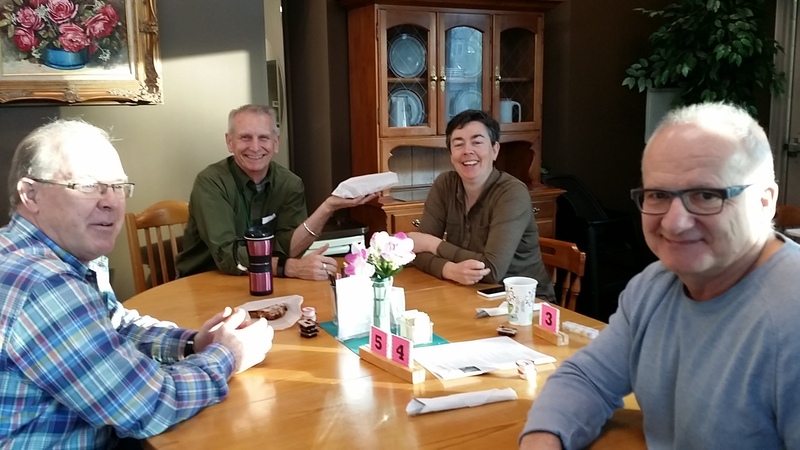 Several months ago, Centre for Human Emergence – Canada colleagues visited Abbotsford, BC and we held a small retreat in the Solarium of Garden Park Tower (GPT). 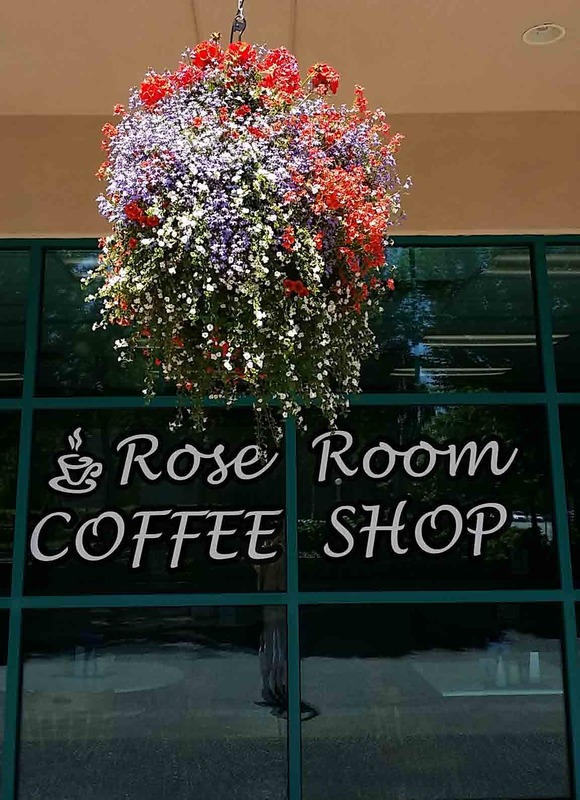 We took our breakfasts and lunches in the Rose Room Café. My friends really enjoyed the energy of GPT and were delighted and amazed with how people in the Rose Room related to one another. GPT has created a very special environment here that people obviously enjoy. But they may not realize that simply by meeting, greeting and sharing a bite to eat they are actually improving their own health, others’ health, the health of the neighbourhood and the health of the whole city. When I am working with teams, organizations and cities who want to change, I am always asking myself: “Where is the energy?” Because where I can see the energy, then I know people are connecting, exchanging stories and entertaining something that sparks vitality. Those energetic gatherings indicate to me where it is possible for change to happen, and health to improve. Have you noticed that people are always attracted to energy? It can simply be the curiosity of why two people are laughing. The difference of opinions about a news story. Or even what is behind a disagreement that raises voices? Energy is attractive – and that is what healthy people, organizations and cities thrive on. These days conference organizers and education designers try to create the conditions for generating energy – not only in the theatre or classroom – but between the formal sessions, after classes, during lunch, at the water cooler. Anywhere it is possible to improve the health of the system by connecting more people to one another. Lucky for us that the Rose Room is as near as downstairs, around the corner or down the street. No one (that I know of) made a rule for people to turn off their cell phones. But in the Rose Room, we seem to have the natural conditions to co-create a habitat for healthy connecting. So the next time you go for coffee, or treat yourself to a cookie – make sure you connect with someone else eye-to-eye, heart-to-heart or with a simple handshake. Every old connection you renew or new connection you make will improve the health of our whole system. Popular wisdom urges us to examine human behavior so that the quality of human life can be improved. We focus on overpopulation, pollution and greenhouse gas emissions as evidence of the mess and stress that humans have contributed to life on Earth. It is obvious that our behaviors affect not only our own species but virtually every other species with whom we share this planet. However threatening these undeniable conditions are, they are the very signals that indicate our next awakening to a deeper consciousness. Super Moon. Aurora Borealis. Solar Eclipse. Spring/Fall Equinox. So many signs and wonders mark our shift of perspective in 2015 from the calendar quarter of Power to the calendar quarter of Planet. It is impossible not to be awed by these celestial events – but it is also possible to use them as a Kosmic fulcrum for thinking about a New Story for the city that is planetcentric. 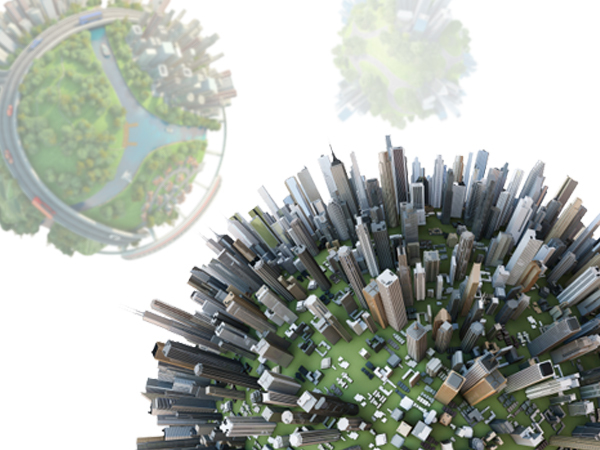 Thinking like a planet brings into focus not only the fractal scales of life that impact the city (see the comments below in From City 2.0 to Nation 2.0) – but it also frames a New Story for all cities as members of a Planet of Cities. This New Story may be a stretch for those who do not follow the science and technology that is taking humans into space (whether that is close to planetary home like Virgin Galactic’s or Elon Musk’s Space X Tourism Trials – or at the farther reaches of the solar system where water has been discovered on Jupiter’s and Saturn’s moons). But every culture has a cosmology that explains the origins of their tribe (if not our species) and thus creates a lineage that explains how human settlements have come to pass. As those lineages have survived, matured and complexified through the stages of traditional, modern, post-modern and even integral, they have created a trajectory of stories that account for the emergence of each stage. However, when we gathered the 60 Thought Leaders, Designers and Practitioners for Integral City 2.0 Online Conference 2012, it was surprising to us that so many did not know each other’s work. Each had a New Story to tell about one or more of the Integral City 12 Intelligences – but many authors were still struggling for recognition within their field of expertise, not to mention outside that field. An explanation for the asymmetric distribution of New Stories that relate to one another has been offered by Brian and Mary Nattrass, who ask: How ARE We To Go On Together: Our Evolutionary Crossroads. As pioneer practitioners of The Natural Step (to leading global manufacturers like Nike) the Nattrasses have learned the hard way that all New Stories have a growth curve. When the first visionary tells the New Story, it is considered as fantastic, futuristic and unrealistic. It is rejected by most as mere fable, but captured by a few “imagineers” who become champions of the New Story and even activists for its realization. But every New Story encounters a gallery of critics and naysayers, with vested interests in the continuation of the Old Story. This sets up an active round of dissonances with the stability of Old Story pitted against the reframing of the New Story in negative terms. The Nattrasses speak to the early proponents of Sustainability creating the narrative for “Unsustainability”. This Critical Stage is a hard fight – and in the Planet of Cities started (and continues) with criticisms of urban pollution, overpopulation, sprawl and inner city blight. The Critical Stage is a “refiner’s fire” where many activists burn themselves out. But those who survive (by dint of not just effort but by the energies of passion and purpose) discover a shift point away from the negative dissonances into encounters with positive dissonances. In this Transformational stage design, science, experimentation and practice uncover new possibilities. Taxonomies of “Unsustainability” become replaced by taxonomies of “Smart Technologies”, “Smart Cities, “Renewability”, “Natural Systems” and “Resilience”. The New Story is finally able to gain hold, after the Transformational stage has emerged new patterns of behaviour, economic successes, and technological results. When the New Story is at its peak, we can look backward and notice the resilience cycle that can be traced from early stage dissonances, to late stage breakdowns, through the desert of despair and finally into the refreshing sunlight of discovery that the New Story awakens for all. Thanks to the Nattrass’s Story about the crossroads of evolutionary stories, it is easy to see that Integral City and a Planet of Cities is a new story about the life of cities. It may be a while before the stages of Criticism and Transformation complete. But from the perspective of a Planet of Cities, we can be attentive to the telling and re-telling of the New Story of Integral City. The greater the dissonances the New Story creates in the audiences of the Old Story, the greater the tensions that will attract the New Story into our orbit (like the Super Moon), light up the skies of awakening (like the Aurora Borealis) and more quickly eclipse the Old Story with the New Story. Perhaps like the Equinox our stories hang in the middle of their trajectories between the dark of the Old Story about the city and the light of the New Story about Integral City? The planetary view of the city seeded by Integral City 2.0 Online Conference (IC20C) has been transplanted to exploration of a Nation 2.0. Of special interest to readers of this newsletter, key contributors from IC20C demonstrated ongoing leadership with Integral Design and Practice expertise in this issue. IC20C Eco-Designer, Ian Wight explored Transformative Education in From Practice to Praxis – as Transformative Education: Leading at the Integral/Professional Interface? IC20C Speaker Coordinator, Linda Shore explored City Leadership in Is True Integral Leadership Possible? IC20C Evolutionary Intelligence Practitioner, Bruce Sanguin’s work was highlighted with a retrospective review of his 5 books by Trevor Malkinson. Team ARGO in Izhevsk, Russia created Russia’s first citizen initiated and produced urban conference. Accomplishing “lift-off” in the first half of 2014 and subsequent dissemination of the best practices through 360 degree communications, Team ARGO are the natural winners of the Meshworkers of the Year Award, 2014…. …Team ARGO seems to have tapped into the inner domains of intention, purpose and culture in all four city voices. March 21 marks the start of what IC calls the Planet Quarter (from March 21 to June 20). What planetary perspectives do you bring to honour Earth and her Planet of Cities at this time of year? What alignments, assets, resources and lineages revitalize you? We notice the Planet of Cities connecting, collaborating, and networking a little more each year. Visit us at Integral City Collective on Facebook and post a short update or a photo. 4. Je Suis Charlie = Ebola Vaccine for the Human Soul? a. Blog Series celebrating the New Story of the City for World Cities Day. 6. 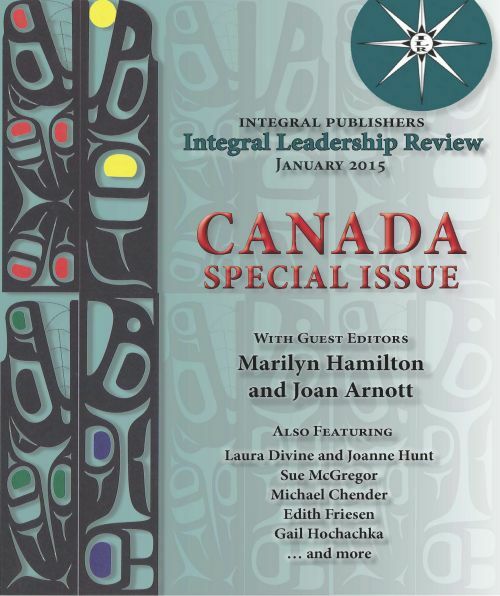 January – February, 2015 issue of Integral Leadership Review – a special issue on Canada (guest edited by Integral City Founder, Marilyn Hamilton) with contributions that build leadership capacities for an emerging Planet of Integral Cities across teams, organizations, sectors and cities. This newsletter is published quarterly using a cycle of perspectives on the Integral City viewed from: Planet, People, Place and Power. The theme of this issue is Place. … When we consider the complexity of hierarchies and centers that make up a city, it is easy to see why cities represent the pinnacle of human social emergence. With their concentration of human populations in focused time-space continuums, they require the most complex forms of social system management ever created. In addition the translation and transfer of the extensions of human systems into built form demands the most complex form of structural system management ever needed by life. Many observers of the human condition suggest that we are naturally resistant to change. Actually I think the exact opposite. The Earth is such a constantly dynamic home, that adaptation derives from our evolutionary lineages and is built right into our histories and daily lives. The combination of the Earth’s rotation around the sun, the presence of our moon, spinning its gravitational pull about the Earth and the axial tilt of the Earth’s spin keep every Earth-based system – including our cities – in constant flux. The September Equinox can serve to remind us of all this fascinating scientific information – or simply be a marker for northern and southern hemispheres, that indicates a shift in how we use that information to adjust our use of energy and matter. Because during the Equinox the difference in daylight is much greater from one day to the next, in terms of our Places on the planet, the equinoxes seem to be times of far more rapid change in our relationship to the great cycles that impact us through sun, light and seasons. Thus it is not surprising that Equinox times somehow seem to heighten our senses to the “tilts” in our Life Conditions that make themselves known through our food systems and signal oncoming harvest season or spring planting. What’s tilting in your Place on this Planet?. September Equinox opens us into a season of many Thanksgiving celebrations around the world. We remember the Places where we have put down our swords and have taken back our pens and ploughshares. We use the celestial signs to celebrate Islamic New Year, Chinese Mid-Autumn Festival, Hanukkah and Advent. And now we can even “ascend into the heavens” and view not only our home Place, but gain an overview (and overview effect) of the whole ofGoogle Earth from space. Which abundant Places could you thank? As if in answer to my plea, UNHabitat has created an opportunity for all cities to celebrate themselves on October 31, 2014. It turns out that, in 2013, the United Nations General Assembly during its Sixty-eighth session designated every 31 October, beginning in 2014 as World Cities Day. World Cities Day is expected to promote global urbanisation, encourage cooperation among countries in meeting opportunities and addressing challenges in urbanization towards sustainable urban development. Read more about it here. But I suggest that every city should use World City Day to celebrate itself as an important member of our Planet of Cities – with a parade through the four quadrants of the city, led by core representatives of the 4 City Voices (Citizens, Civic Managers, Civil Society and Business) , enlivened by street parties and culminated with celebrations in all the faith systems of the city (see my article for more details). Because our cities are now repositories of so much wealth and complexity, they are precious and vulnerable living systems, whose existence deserves to be celebrated. This consciousness can contribute greatly to their future thriving and flourishing. How will you celebrate your City-Place on October 31? How might you invite others to celebrate? What is the Relationship between our Place in the Human Hive and Inner Work? While in Budapest at the first Integral European Conference (IEC), Marilyn Hamilton was interviewed by Alex Howard of Conscious2 TV. They talked about her book Integral City, and the relationship between city life and inner work. Watch the Video of the interview here. 15:57 – What supports people in engaging more in their community? How Does Integral Spiritual and Life Practice Cross-Train Us for Thriving in City Places? 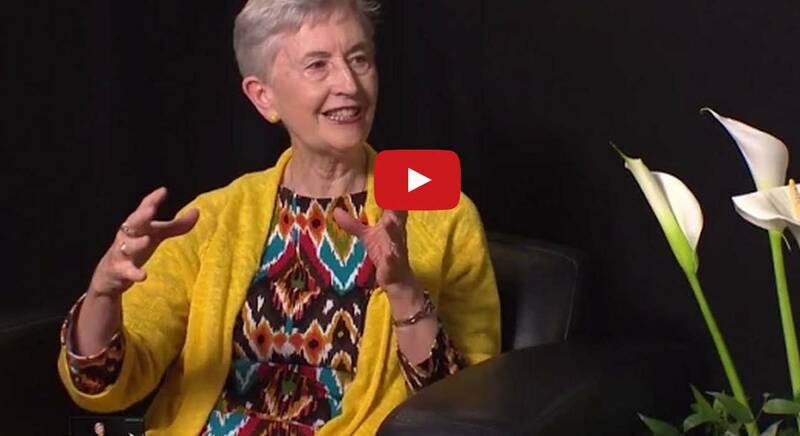 Also at IEC Terry Patten (co-author of Integral Life Practice and a key Thought Leader forIntegral City 2.0 Online Conference) was interviewed by Alex Howard of Conscious2 TV. They explored how Terry sees life as a school that continually gives you the lessons you need until you learn them. Terry explains Integral Life Practice without jargon and comments on the value of “cross-training” the spirit and the body and hanging out with people who stretch your capacity to reflect on self and others. Watch the Video of the interview here. How Can You Facilitate the 4 Voices to Engage and Enrich Place? Last year we introduced our Learning Lhabitats to encourage the convergence of the 4 Voices of the City. (Read more about Learning Lhabitats here.) In order to strengthen and catalyze these Voices, Integral City has created a scaffold of learning modules to guide Practitioners, Catalysts and Meshworkers to gain skills and knowledge for waking up the “Integral City” that lies dormant in so many Places. This year, we are delighted to let you know about two programs being delivered by Integral City colleagues that further unpack the scaffold. 1. Learn to co-create places where there is just enough chaos to evoke collective wisdom, and just enough order to discover wise action. This framing for training that engages self, other and places, comes from co-developer of the Learning Lhabitats, Beth Sanders and her team from Populus. They are delivering The Art of Hosting BIG Decisions While Looking After Self, Others and PLACE. This will take placeNovember 25-28, 2014 in Edmonton, Canada. 2. Cultivate authentic presence, clear purpose and agile perspective-taking. We want to introduce you to our Integral colleagues, Rebecca Colwell, Diane Musho Hamilton, Cindy Lou Golin and Rob McNamara. They are offering the second Integral Facilitator® Certification starting October 29, 2014 in Salt Lake City, Utah. Integral Facilitator® is a 9 month professional training program in the advanced competencies of facilitative leadership and masterful facilitation, designed for leaders, facilitators, coaches, trainers and professionals working with groups. By combining the core skills and techniques of masterful facilitation with leading insights from the fields of developmental psychology, integral theory and mindfulness practices in the Zen tradition, Integral Facilitator® provides core training for self-actualizing individuals who wish to unlock the subtleties of human interaction that can make a difference in waking up the Human Hive. Read details and how to register here. In this last quarter I have written 2 Blog series. The first explores the injunctions on Optimizing the Impact of Integral City Practices inspired by Dr. Roger Walsh at Integral Europe Conference; the second taps into the research of author, Frederic Laloux and what Reinventing Organizationssuggests for Reinventing Cities. 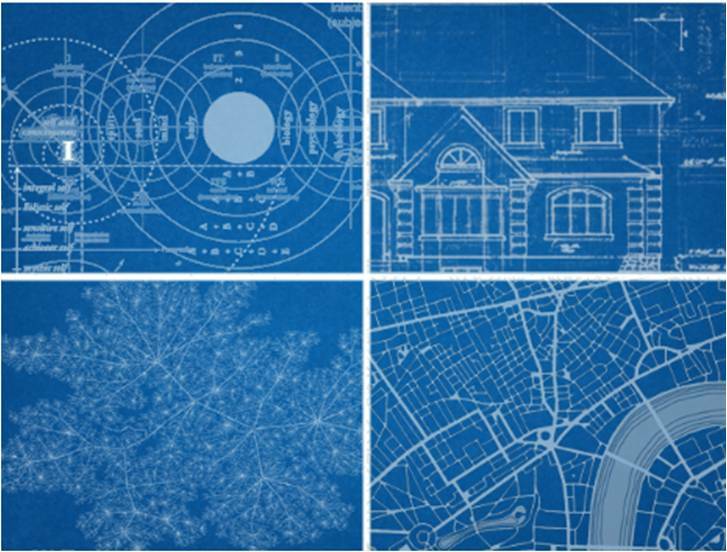 • Here is a link for the series on Optimizing the Impact of Integral City. • Here is the link for Reinventing Organizations to Reinvent the City. September 21 marks the start of what IC is calling the Place Quarter (from September 21 to December 20). 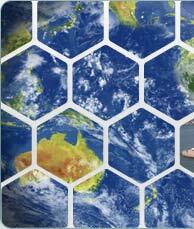 What do you think of the new World Cities Day? How do plan to celebrate your city — whether that be as an individual, a family, an organization, a community, a Voice? Or????? We would love to learn from you how we can amplify the celebration of our Planet of Cities. Visit us at Integral City Collective on Face book LINK and post a short update or a photo. 2. BY DONATION – download of Reinventing Organizations. 3. 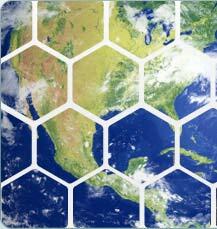 Register for the third Integral Living Room Oct 9-12, 2014 – Theme: COSMOS TO KOSMOS: An Integral Spacetime Odyssey. ILR plans to explore an awesome universe governed by natural forces such as gravity and electromagnetism, expanding them into the gravitational pull of goodness, truth and beauty, and the magnetism of attraction and love as forces we can work with to co-create a better world. 4. Download Podcasts of the interviews with the 12 Thought Leaders from Integral City 2.0 Online Conference 2012 (IC2OC). They explored Place through each of the Integral City Intelligences. Podcasts are available here at a 30% discount for Reflective Organ readers. Individual Thought Leaders can be downloaded for $10 each). We can optimize the impact of Integral City Work when we come from our direct experience and bring contemplative wisdom into the mainstream. Roger Walsh‘s Optimizing Guidelines (delivered at IEC), suggested that we transmit to others, our deepest inner experience and deepest contemplative wisdom we have learned from the Masters. 1. We can imbibe wisdom. From where? From whom? We must follow the energy of the wisdom that calls us, speaks to us, and even “marinates us” so that we are inspired to transmit it to others. Lev Gordon at ARGO (Association of City Development) in Izhevsk, Russia is a good example. He affirmed to me on my recent visit, that he responded well to our injunction “to follow the energy” because it allowed him and his team to access their highest callings and focus on thriving. That’s why ARGO set out to create, Urbanfest, as the first citizen-initiated conference on city development in Russia. 2. We can master the concepts and the language of the community we are trying to talk to. Within the Integral City Community of Practise, Beth Sanders stands as an exemplar of Engaging the 4 Voices of the City. She has mastered the language of city planning through her education, her service to the profession (serving as Treasurer of Canadian Association of Planners, and Past-President of the Alberta Professional Planning Institute) and her ongoing community meshworking practise. As a result, her skills for going “where angels fear to tread” in public consultation meetings, build new bridges, confront old conflicts and open new options in cities all across Canada. Aha! Insights (aka BFO = Blinding Flash of the Obvious) are usually the most simple and obvious points when we hear others repeat back to us in their own words what we have said. An early example for Integral City came from Dr. Robin Wood, Founder of Thriveability Foundation, who was the first person to review Integral City: Evolutionary Intelligences for the Human Hive. Instead of simply citing the 12 intelligences, he summarized them into 5 easy groups: Contexting Intelligences, Individual Intelligences, Collective Intelligences, Strategic Intelligences and Evolutionary Intelligences. For me that was an Aha! and BFO all combined into one – because I felt understood AND now I had new, simpler language to talk to others about ideas that they can easily understand. Robin translated the contemplative integral wisdom behind Integral City into “business-speak”. Beth translates it into “community-planner-speak”. Lev translates it into “citizen-speak”. … deep bows to Roger Walsh,who is a Master of living his injunctions to learn from the Masters and translate meaning to others out of deep personal experience.